Point of Contact is an Austin, TX band that was formed in 2002 by guitarist/vocalist David Cloud, bassist Jeff Nabona and drummer Bill Dykas. Currently they have 2 albums under their belt. The guys have played all over Texas and have had local success on radio as well as several high profile showcases on SXSW. 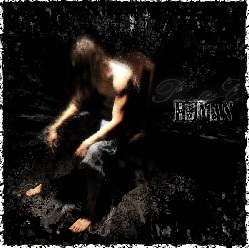 For review, we have their sophomore album "Human". Point of Contact mention that they are described as "Metallica meets Godsmack" but by listening to their CD it is also inevitable that one notices they have been influenced by the likes of Tool and Led Zeppelin. The band has an eclectic sound that yet has enough organic quality to keep it lively, something that I felt at times Tool is lacking, so to me their more mainstream metal and rock influences are a plus here. The production has a bit of a garage vibe which also keeps it raw to a point. The songs are mostly well written and the performance is very tight with special kudos to the vocal parts and the interesting use of guitar and synth effects that add to the depth of most of these tracks. The CD opens up with an intro which then blends into a riff not at all dissimilar to Zep's "Kashmir" on the song "Hollow". The similarities are quite big so I am surprised this somehow went under the radar. There are also quite a few songs that open up with some kind of gimmicky guitar or synth effect that in a way signaled their more "epic" songs. Out of the CD, the ninth track, the ballad "Inside the Mirror" to me stood out the most as it offered a different glimpse into the band, showing that they can write with sparse instrumentation and still get a point across even with more conviction that on some of the more effect-laden tracks. This song could easily be in a movie. There are also quite a few heavy rockers on "Human", such as "The Other Side of You", "What You Hide", "The Enemy" so there is a bit for everyone. I felt that Point of Contact were overall doing better in the more dynamic livelier performances on these songs and were finding more of their own voice there. All in all quite an interesting release, definitely worth picking up if you're into something heavy yet with a deeper soul.